Both Premise and Termidor have been extensively tested by various authorities but Premise has been longer on the market with 100% effectiveness. Premise was first on the market with well proven results and inexpensive. Premise is a termiticide that protects our homes and businesses from termites, without destroying the balanced environment we live and work in. Premise is a treatment everyone can live with, except termites. Extensive research indicates that Premise has low toxicity to humans, pets and wildlife. On the Contrary, it is lethal to termites. It not only destroys termites that come in contact with the treated soil, but also enables nature to take it toll. For example, when termites enter the "Premise Treated Zone" they stop feeding, become disoriented, discontinue grooming each other and neglect their environment. Consequently, fungi and microorganisms inhabit the soil. This leaves fatally diseased termites. Premise effectively kills termites instead of repelling them. This action is known as Premise plus nature. Why is Premise Different from other termiticides? Premise is a revolutionary chemical that acts in a totally different way to other products on the market. Premise is Australia's first water-based termiticide. Premise has a unique double action, known as, Premise plus nature action (as previously discussed) Premise provides effective and reliable treated zone and it is registered for use through reticular systems and spreads well in soil. Premise effectively kills termites. Premise has no measurable airborne residues. Premise has No odors or solvents. Premise has Low risk to humans (Cautions S5 label) and Low rates. Premise has No irritancy and is Non Hazardous. Premise lasts a minimum of 2 years and has been known to last a maximum of 6 years. This revolutionary treatment - Premise is the answer to protecting your home or business from termites, without destroying the balanced environment we live and work in. Premise was first released for use in the public arena in the USA more than 7 years ago - it is the original non-repellant termiticide (as discussed below). 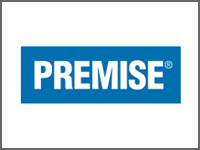 Premise has since built a solid reputation as a reliable long term termite control product with virtually no serious problems encountered in the market place. In addition, termites can transfer Premise to other termites through social interaction and cannibalism, affecting the entire termite colony. Bayer calls the Premise transfer attribute its Domino Effect, which means Premise, not only kills termites, but also substantially reduces or eliminates termite colonies. Together these attributes have proven to be highly effective termite eliminator. Part of the Bayer terms and conditions of such a guarantee states in effect "if Premise fails to stop termites at any time within seven years of initial treatment, Bayer will reimburse up to 100% of product and labour costs involved in re treatment to a maximum of $1000 for residential accounts and $5000 for commercial accounts. Bayer will also guarantee to pay the termite controller's damage claim insurance deductible up to $500 per structure". The installation of a Premise treated soil zone requires expert knowledge and specialised equipment to form a complete and continuous barrier to protect the building from a termite entry and infestation - as illustrated to the right. Recently Bayer conducted the most extensive analysis of a termiticide effectiveness ever conducted in the history of the USA pest control industry. In this study of actual use conditions, Bayer found more than 99% of buildings treated by Premise at full label applications required absolutely NO re treatment throughout a 5 year period following the initial treatment, with no serious re-infestation problems or failure of the product's effectiveness. This is an outstanding result given the tenacity of termite species in the USA and wide variation in technical skills of applicators, climatic conditions, soil compositions and building construction types evident throughout the United States. Bayer claims "there is no technical or commercial reason to use any termiticide other than Premise". The results tend to speak for themselves. The "Domino Effect" of Premise has been observed through controlled scientific testing on live termites. Extensive testing by the US Dept. of Agriculture - Forest Service and the University of Hawaii documented lethal transfer of Premise from exposed to unexposed termites even when they were exposed to 100ppm Imidacloprid - the active constituent chemical in Premise termiticide. The first step in a Premise termite control program is for your termite controller to thoroughly inspect your premises in order to assess the level of infestation and the extent of the threat to your property. Based upon this inspection, the termite controller can recommend exactly where and how the Premise soil treatment should be applied. Premise is a lower cost-effective termite control program. The cost of a Premise program depends on the size and design of the subject building, the extent of the infestation, the risk of further attack and on-going termite activity and other environmental factors. Where a complete Premise soil treatment is not practical or desired by the property owner - then we recommend the Nemesis termite baiting system also be installed. The US Dept. of Agriculture - Forestry Service, has tested Termidor for more than 8 years. So far, results show 100% effective termite barrier protection. The best alternative and main competitor in the marketplace is Premise termiticide, owned by Bayer Environmental Science. The installation of a chemical soil barrier requires expert knowledge and specialized equipment to form a complete and continuous barrier to protect the building from a termite entry and infestation - as illustrated right. Termites cannot detect the Termidor chemical as it has virtually no odor, taste or smell to the termites. Termites cannibalize or carry away dead termites killed by the Termidor on their bodies, further spreading Termidor's deadly effect to other termite colony members. Termidor is more expensive than alternative products, so BEWARE of "dodgy or unlicensed" companies which undercut the required application rate in order to cut costs, which will NOT provide the level of protection necessary. Refer to the CONSUMER ADVICE section later on, for tips on selecting a reliable pest controller. 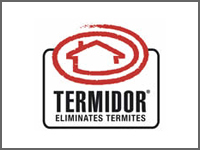 Termidor Dust is the latest termite elimination product to be released and is rapidly being acclaimed as the most effective elimination product on the market. Dust' is a non-replellent, ingestible product containing food grade alpha cellulose, the same material used as the food source in most termite bait systems. However, what makes 'Dust' different to other bait systems is its incubation period which allows just enough time for lethal powder to be transferred from one termite to another. The manufacturer claims this Transfer EffectTM gives 'Dust' an edge over all other termitcides. The termites will go about their normal activities long enough to pass the Termidor Dust to numerous other termites until its spread throughout the colony. All it takes is physical contact between termites for 'Dust' to be transferred and spread through the colony. As termites are social insects, feeding and grooming each other in large close-knit colonies becomes the ideal scenario for the Transfer EffectTM. 'Dust' can also be eaten by the termites like bait and the deadly effects will take hold just the same. By the time the termites begin feeling the effects either via direct and indirect contact or ingestion, it would be too late for the colony. Research has found that using Termidor Dust takes approximately 2 to 4 weeks for total colony elimination, much faster than baiting systems and requiring less visits to achieve success. Another unique difference between Termidor Dust and other dust and baiting products is its Fluorescent Termite TrackingTM technology. Termites dusted with Termidor Dust will glow a bright yellow when exposed to UV light such as a simple black light torch. This allows pest control operators the ability to track termites that have been dusted and helps in determining if termites found in close proximity to the treated structure are from the same colony as those previously dusted. Termidor Dust is registered for use in bait stations and aggregation devices.